It's fairly common to suggest some escapist epics or saucy stories to take to the water's edge during the warmer months. But when are we more in need of mental transportation than mid-winter? City thought it would be fun to flip the "beach reads" concept, and consider what stories are more suited to snowdrifts than sand. In addition, we asked two local literary specialists for their favorite winter tomes. Karen vanMeenan, editor of "AfterImage" and director of special projects at Writers & Books, suggested some phenomenal novels, and Peter Conners, publisher at BOA Editions, named the poetic collections he associates with winter. Here are a total of 10 titles to take under the covers, or to cozy up with beside a roaring fire. They aren't necessarily overtly snow-themed — some are wild, yet deep, fantastical romps, and others will offer some proper catharsis as they rend your heart in two. Because we want you to take the journeys yourself, we've tried to avoid spoilers. 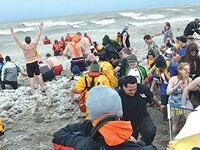 Read on for our suggestions, and add your own winter favorites to the online version of this article at rochestercitynewspaper.com. Each year, Writers & Books suggests a new powerful story for its "If All of Rochester Read the Same Book..." city-wide book club challenge. In the spring, various book discussions are offered, leading up to a visit by the author. The selection for 2014 is the deftly bittersweet work "The Snow Child" by Eowyn Ivey (416 pages, Reagan Arthur/Back Bay Books). In the book, a husband and wife seek a new beginning in the Alaskan frontier after the death of their child. Urgent longing and a hand-built snow child yield the unexpected: a seemingly invulnerable wild girl who hunts in the woods near the couple's homestead. The miracle snow-sprite seems summoned from a fairy tale, but in fact carries her own painful history. Ivey seamlessly blurs the territories of loving and letting go, and of myth and bleak, stark tragedy, ultimately offering no firm interpretation of the events that so dramatically alter her characters' lives. Tom Robbins' smirkingly brilliant "Jitterbug Perfume" (352 pages, Bantam) is a tale that spans the ages and many cultures as a handful of characters seek the components for a life-sustaining scent. Veterans of Robbins' hilariously tangled yarns will recognize his penchant for dropping the story periodically to inject philosophical rants, the secret and magical lives of myths and inanimate objects, and his unapologetic gawking at human sexuality. (A friend once asked me to measure the sexiness of a book by saying, "On a scale from Prude to Tom Robbins, where does it fall?"). This one will help pretty much anyone to lighten up in the midst of winter's darker days. "The Rooster's Wife" (88 pages, BOA Editions), a prose poetry collection by Russell Edson, is among Peter Conners' top picks. "Edson is an American master of the prose poem and simultaneously one of our funniest and darkest poets," Conners says. "The holidays are so filled with intense emotions; it's a huge relief to pick up some Edson poems and see him disembowel — sometimes literally — our most sacred cows with a flick of his pen and a sly grin." Mark Helprin's "Winter's Tale" (768 pages, Mariner Books) "has been a favorite since its publication in 1983," says Karen vanMeenan. "It is an immigrant tale, a coming-of-age story, an adventure tale, a fantasy," she says. The fantastical story is set in a gritty mostly-familiar New York City, takes place largely at the turn of the 20th century, and follows the magical adventures of a drifter thief, Peter Lake, and a milk-cart horse who discovers he can fly as he becomes Peter's unlikely guardian angel. The Colin Farrell-starring film adaptation by Akiva Goldsman is set to hit theaters this year. "Shakespeare wrote 'a sad tale's best for winter,' and I concur if it is a story by Richard Yates, such as the devastating 'Revolutionary Road,' which shatters the illusions of postwar America," says vanMeenan. In the novel (355 pages, Vintage), the unhappily married main characters hurt one another repeatedly as they struggle to reconnect to any form of security or meaning, and emotional isolation rears its powerful head. This is all underscored by the author's summary of his own novel: "If my work has a theme, I suspect it is a simple one: that most human beings are inescapably alone, and therein lies their tragedy." Ditto on the dark tones for Debra Dean's "The Madonnas of Leningrad" (231 pages, Harper Perennial, and Writers & Books' "If All of Rochester Read the Same Book...." selection for 2012). The book "moves between the staff of the Hermitage safeguarding the artwork during the siege of Leningrad and an aging woman struggling with Alzheimer's in the current day," says vanMeenan. But the keenly sensitive can rejoice: the story does not dwell on suffering, says vanMeenan, "but on finding hope and celebrating love amid the detritus." Conversely, ironic tragedy reigns in "Ethan Frome" (104 pages, Nobel Classics), Edith Wharton's classic tale of doomed romance as the characters decide between following through on moral duty or giving the heart what it wants. This short novel is atypical for the author's elite society-based tastes, in that it is set in a rural environment and features a host of common folk. Deep and isolating snow becomes a symbol for longing suffocated by circumstance, and the story contains what is without a doubt the most depressing sled ride in all of fiction. Travel back in time with the narrator as he unravels the tale behind the title character's current predicament. Family is ever a reliable source for a good yarn. "As I've gotten older, it's become more important to me to listen to family stories," says Conners. "The holidays are a good time to really tune in, listen to those, and ask some questions." He suggests "Transfer" by Naomi Shihab Nye (128 pages, BOA Editions), in which the author dives deeper than ever into her own family heritage. "The book centers around her father and even uses his journals as the jumping off point for many poems," Conners says. "Lucille Clifton is one of the rarest types of poets — her work can be shared at everything from funerals to birthdays to holiday dinner toasts, and her mixture of gravitas and wry wisdom will not only fit the occasion, but deepen it," says Conners. "In short, reading Clifton's work will deepen your own life experiences." Conners suggests "The Collected Poems of Lucille Clifton 1965-2010" (720 pages, BOA Editions) as "the perfect companion to have at your side as the snow falls and the wind blows." 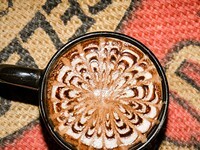 Hot chocolate round-up, can't-miss events, showshoeing, and more! Winter brings with it a mixed bag of emotions. Annoyance is one, like when you have to read all the snow-related complaints on Facebook and Twitter. During the bleak Rochester winter, it can be tempting to go into hibernation mode — grab the warmest down comforter you own, pop open a box of bon-bons, and curl up for a Netflix marathon. However, staying active during the winter is important, not only for your physical health, but your mental health as well. 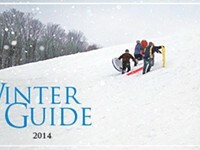 Yes, Rochester winters can often seem endless, but City is here to help you make it through these dark times with a selection of 14 can't-miss events from the first quarter of 2014. Did we miss something especially exciting on your personal calendar? The whole "walking on water" idea is cool, but when the temperatures plummet in Western New York, walking on snow and ice will have to suffice. And it does for the thousands of snowshoers in our region area each year.